*7. *9,594　*,*14,285　Shounen Onmyouji "Sakai no Kishibe ni Yomigaeru"
20. *4,077　*,*51,748　Bungou Stray Dogs "55 Minutes"
13. *9,594　*,*14,285　Shounen Onmyouji "Sakai no Kishibe ni Yomigaeru"
50. *4,077　*,*51,748　Bungou Stray Dogs "55 Minutes"
She is the best grill anyway after she appeared in vol 6 cover, and pity that second season won't cover that part. Anyway the rankings were expected anyway, now to see how long this stays up. Is there some reason why the stats from your side of Oricon is different from the stats Snow showed? The OP is the ranking of individual volumes. What I posted is the series ranking - so all volumes in the same series are counted together. Ah okay. Thanks a lot. Well it's been a good run nonetheless for Kimi no Na wa. Oh well. It had a great run nonetheless. Expecting the next Shinkai Makoto movie to be awesome. If KonoSuba can remain at #1 for another 10 weeks, sure. *2. Kono Subarashii Sekai ni Shukufuku wo! Finally it fell from no.1, but seeing the sales I'll bet it'll pop up again next week. Overlord still selling I wonder if they've restocked the limited edition already. I'm ready for more EXPLOSION and DARKNESS MOE!!!!!!! Konosuba s2 giving more boost. i can't wait to see how much it will sell after that. Sword oratoria should give Danmachi boost as well and hoping for a 2nd season in the future. Overlord movie will bring in more fans to the series and with the current sales 2nd season is more likely to happen. 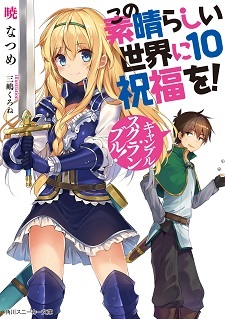 I don't know if its because it came out the month after the 9th vol. But Re:Zero sales are really good they are always selling slowly but steady. This may slow down as the volumes do too. Looking at the previous ranking in volumes. Vol 1 should have 200k+ and vol 2. around 170k+. Correct me if im wrong though. This is the time for Kii to be on cover again. Also this is the most beautiful drawing that Poco ever have. I love you even more Maki. A good newcomer entry on HJ Bunko. what anime is that Sig? Konosuba and Re:Zero makes me happy.